Below is an example of the kind of free coverage of conferences and industry events found within LearningTimes.org. Join today to enjoy real-time access to a growing repository of knowledge shared among a network of colleagues worldwide. In excerpts from their "Audio and Video Blog" found inside the LearningTimes.org community, LearningTimes members provide live audio and video dispatches from the 10th Annual Online Educa conference in Berlin, an international gathering on online and technology-enhanced education. Coverage includes an enlightening video-based discussion with six high school students about the kind of learning opportunities they are expecting. Excerpted from the community at LearningTimes.org. Become a member today for complete access to this and other resources (it's free). 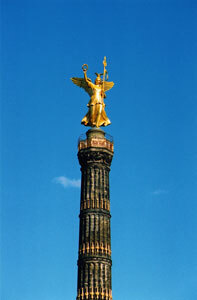 LearningTimes is on location in Berlin providing coverage of the 10th annual Online Educa conference. We're live in Berlin for the 10th annual Online Educa conference. The program features a global dialogue on advances and current thinking in technology-supported learning. This year's conference is being attended by nearly 1700 people from over 60 different countries, representing all continents. Together with LearningTimes contributors and board members Dhal Anglada (from New York) and Paul Stacey (from Vancouver), I'm here to learn with and from others, many of whom have very unique perspectives on the world of technology-enhanced learning and teaching. The conference is a densely-packed two days of non-stop sessions and networking events, but we're going to try to take a few moments to share a few observations and guest blog appearances with you here in this special BerlinerBlog. Feel free to "reply" with comments, questions or observations of your own -- we're pleased to hear from you! I had the opportunity to catch up with Frank Boosman after a panel presentation in which he participated on the creation of games and simulations in learning situations. Frank focused on the need to provide opportunities for online learners to learn by doing, since research and experience show that hands-on activities result in greater retention than more passive learning activities. Frank Boosman is from 3DSolve. 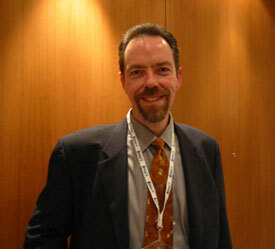 His presentation title was "From Videos to Simulations: New Technologies in Training". A highlight of the conference for Paul, Dhal and me was attending a session entitled "Learners of the Future". Unlike most other conference sessions on online learning that I have attended, this one featured actual learners! In particular, it featured a very active discussion with about six teenagers and one seven year old from different backgrounds talking about their use of technlogy inside and outside the classroom. Some of the teens who offered their perspectives on their use of technology inside and outside the classroom. As panel organizer and moderator Bill Seretta pointed out to us, this session was meant as a wake-up call to the e-learning industry. Pundits can talk about the future of learning all they want, but young people like this ARE the future of learning. If we don't spend some time understanding how they are using technology, we'll be ill-prepared for how they learn and how to teach them effectively. The panelists were very articulate, and very candid. (And the youngest panelist, a seven year old from Australia, happened to be the daughter of LearningTimes member Frankie Forsyth!) They talked about IM (instant messenger) use, their involvement in online games, their predictions for the future, and some of the "rules" of their world of social computing today, inside and outside of school. Dhal Anglada and I caught up with the teens from the panel -- and Bill Seretta -- after their formal panel to continue the dialogue they started, and recorded a special piece to share some of the teen's insights and ideas with all of you. Click below for a 15-20 minute Real video clip of our informal conversation -- a conversation which stimulated an hour or so of continued discussion (over dinner) among all of us LearningTimes members here in attendance. I attended a set of sessions today on creating web sites and course content that are accessible to those with disabilities. I was curious to hear how various educators and web designers and governments are approaching the need and desire to ensure that all learners can access content and interact fully in online experiences. One of the speakers I heard was Diana Andone, M.Sc., of Politehnica University of Timisoara in Romania. Diana is involved in a multinational project funded by the European Union to design and offer accessible web-based courses about creating web sites that are accessible. Diana Andone of Romania with Jonathan Finkelstein after a session on an EU funded project on accessibilty. Expectations can be very high for such self-referential courses, if you will, where you are hoping to model what you are teaching by how you are teaching it! "The REMOTE Leonardo da Vinci project is an innovative ICT educational product aimed at supporting learners with disabilities to develop skills necessary for entering and remaining in employment. Using an integrated fat/thin delivery mechanism which utilises a media-rich CD with low bandwidth on-line content from a central on-line learning hub, the product is compatible with current standard internet provision found in homes and businesses across Europe. The product will result in a new web design technologies qualification which will be available to learners in retail outlets in the UK, Spain, Romania and Germany, and which will be accredited through a UK National Awarding Body that forms part of the partnership." Clockwise from top left: Teresa Golden (New York), Anke Kirch (Germany), Andre Pieck (Belgium), and Nancy DeViney (New York). One of the plenary session speakers at the conference was the General Manager of Learning Solutions at IBM, Nancy DeViney, who has been with the company for 30 years. Her learning-focused work has included responsibility not only on client needs when it comes to training and education, but also internal learning for thousands of employees across the globe. I was particulary curious to hear how a global organization -- that has boldly set learning as a key strategic internal area for the entire company -- is fostering a culture for learning and providing tools, incentives and resources for their employees to walk the very talk they share with their clients. Joining me around a conference room table for this enjoyable discussion were Nancy DeViney, Teresa Golden (IBM Learning Services, from New York), Andre Pieck (IBM Learning Solutions, from Brussels), and Anke Kirch (IBM Emerging Business Opportunities, from Hamburg). Here are about 20 minutes of our conversation, in which we talked about IBM's internal culture of learning, international working groups and interdisciplinary collaboration, and achieving basic ICT literacy skills internationally. We also learned about some new projects within IBM which tap into the world of social computing. One area of great interest to me was a notion of of "people proxies", which is essentially a robust instant messaging and real-time expert location system whereby employees at IBM can first identify, then locate and connect with people within this large company who can assist them just-in-time with the tasks at hand. Several of the sessions I attended related to m-learning, or mobile learning -- educational experiences enhanced by or taking place primarily on wireless devices, such as PDAs (personal digital assistants), laptops, tablet PCs, mobile phones, text messaging, etc. m-learning is really just another piece of the learning (or e-learning) puzzle. There is certainly untapped potential for the use of wireless devices inside the classroom, but the most dramatic impact of wireless, portable computing may very well be in facilitating and enhancing site-specific field work. The ability to give learners the freedom to leave their desks, and go out into a physical world filled with primary sources and original locations, while still being connected to virtual storehouses of data and to peers and experts, can be a great new recipe for learning. 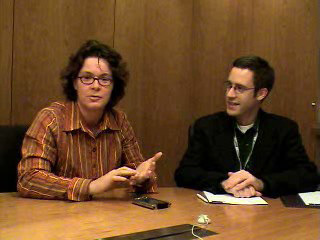 Petra Wentzel of Amsterdam talking with Jonathan Finkelstein about mobile learning. M-learning can also be a great distraction, if not used with wisdom, restraint and/or moderation -- How many times have you returned from a vacation with 3 hours of video footage or 200 photographs, but only faint recollections of where you were when the images were captured, because you had you a camera covering your face the whole time? In the early days of using mobile devices in the field for education, we need to avoid that trap, and instead use mobile tools and connections to amplify the magic and learning effect of exploring authentic places -- in the virtual presence of authentic data and people located elsewhere. The promise is great. One person who is beginning to uncover that promise is Dr. Petra Wentzel, from the Centre for Educational Training, Assessment and Research (CETAR) at Vrije Universiteit in Amsterdam. Petra talked about the use of mobile devices in field-work intensive courses, such as archaeology courses. Petra sat down with me and Dhal Anglada for a conversation about her exciting and meaningful work in this area. Here's a video excerpt (about 10 minutes) from our conversation. 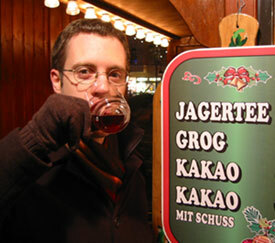 Jonathan Finkelstein and his grog. It's cold here in Berlin. Well, not in the conference center, but outside. You know, "outside" -- the place you forget exists when you are at a conference. I realized tonight, after all of the sessions ended, that we had not been outside in a day and a half. It's time for some traditional hot German wintertime grog, like this batch I happily polished off the night we arrived here in Berlin, in the company of Dhal, and Paul and Deborah Stacey. Well, this is my last official dispatch from Online Educa 2004, although you can be sure we'll see some of the themes and people we met here resurface within the community in the days ahead. In other words, done with the blog, bring on the grog. I've used GPS with my first-year students for campus mapping projects here at EMU. The teaching issues mentioned in your abstract are pertinent to my experience also. There is some research and classroom GPS environmental work being done by MIT/Wisconsin and Michigan folks. In m-learning sessions in Berlin -- in what new contexts are brought up?-- what's being developed? -- any insights? Also, could you restate the ARCInfo program that Petra mentioned in addition to BbUnplugged. It was the ARC program designed for small scren PDA use. Please feel free to have a look at our project website. And let me know if the information in this article gives an answer to your question. Thus far CropSpy (now called CropViewer) was only used during real fieldwork, but in our project we will use it in education soon. The above posts were excerpted from the online community at LearningTimes.org. Become a member today for complete access to this and other resources. It's free!